There really is nothing else quite as cool as a horned lizard. They look prehistoric and yet oh sooo cute. When I was just a young lad, I was given one as a pet. It lived in a terrarium and I caught ants for it to eat. My best recollection is that I had it for almost two years. As I grew up in Lake County in northern California, I presume that my pet lizard was actually a Coast Horned Lizard Phrynosoma coronatum (above). This is the widespread California species west of the deserts and the Sierran-Cascade mountains. Finding them in the wild, though, is difficult. Despite living and birding in their habitat throughout my life, I've only encountered a handful of them. The "hand-full" below (held by Rita Carratello) is one of three in adult patterns found during Breeding Bird Atlasing in a remote corner of the Santa Lucia Mountains. Otherwise, I've only seen solitary lizards, and they rarely move. They don't like to be picked up (once one squirted blood from its eyes in defense). According to Stebbins (2003) this "blood comes from a pore in the eyelid region" and can spurt "several feet. It has a repellent effect on coyotes, foxes, and perhaps other predators." 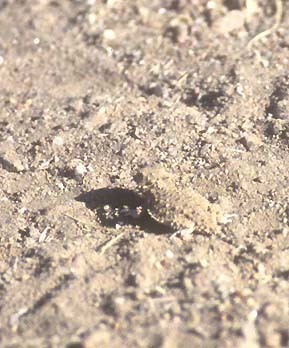 This species of horned lizard, and most others, feed heavily on ants. In autumn, I once found a juvenile Coast Horned Lizard high up in montane chaparral (below right). It was only the size of a U.S. nickel and was almost invisible against the dirt patch it was crossing. It lacked the adult's colorful patterns but did have a banded tail. Top: May 87 near San Clemente Reservoir, Monterey Co.
Left: 24 May 1992 in w. Ft. Hunter Liggett, Monterey Co. 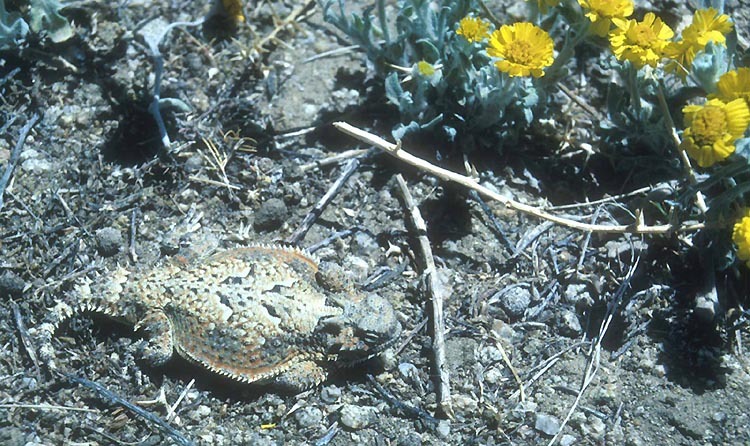 Right: juvenile 30 Sep 2003 at Chews Ridge, Monterey Co.
To date, the only other California horned lizard I've encountered is Desert Horned Lizard P. platyrhinos (below; photographed at Deep Springs, Inyo Co., in May 1985). 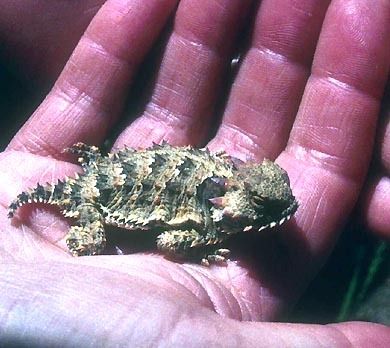 Stebbins (2003) calls it the "desert counterpart of Coast Horned Lizard." It inhabits a wide range of arid habitats (dunes, alluvial fans, patches of rocks and sand) throughout the higher deserts of southeastern California and the Great Basin east of the Sierran-Cascade divide. This photo is of the northern nominate subspecies P. p. platyrhinos. The is a Horned Lizard Conservation Society with a web site and a lot more information on biology and other topics. Sanborn, S.R. 1994. The Lizard-Watching Guide. Lorraine Press, Salt Lake City, UT. PHOTOS: All photos © 2003 Don Roberson, all rights reserved. The specifics are with each photo.